Heart disease is often regarded as a problem that a person is born with, or something that eventually happens in older adults. Non-modifiable risk factors like advancing age and family history are not the only reasons for heart disease. In fact, 80 per cent of premature deaths from cardiovascular disease could be avoided if modifiable risk factors like tobacco use, unhealthy diet, physical inactivity, high blood pressure (hypertension), diabetes and raised lipids are addressed. According to the World Health Organization, 38 million people die each year from non-communicable diseases of which cardiovascular disease alone claims around 17.3 million lives. Since 2002, the World Heart Federation has been spreading awareness about heart disease and stroke being the leading causes of death through World Heart Day. This year, to address the aggravating situation of cardiovascular disease, the organisation has called on everyone to join their petition for creating heart-healthy environments. In solidarity with the cause, BRAC is proposing a frugal solution which others can adapt to control the risk factors of cardiovascular disease. BRAC developed the shasthya shebika model decades ago to control tuberculosis and diarrhoea, and enhance maternal and child health in rural areas. 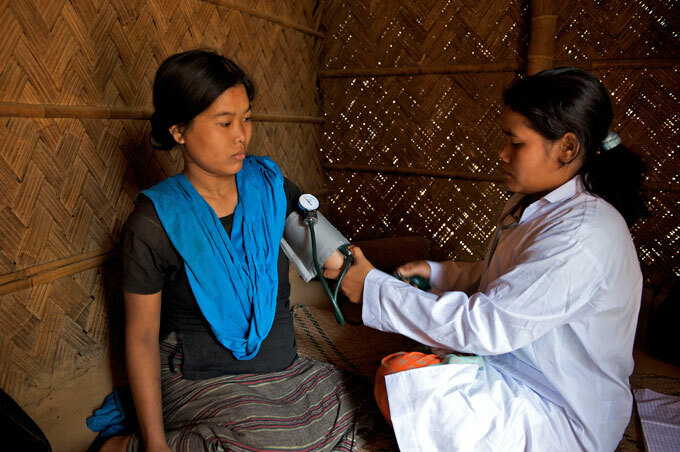 Shasthya shebikas, also known as community health volunteers, are cadre of female volunteers recruited and trained by BRAC to provide a range of essential healthcare services to their communities. The members of a village organisation – an association of women created by BRAC in a community – nominate candidates to be trained as health volunteers. In this approach, the health volunteers do not receive a salary or monthly stipend, they are provided with financial incentives on the sale of basic medicines and selected health commodities to their community. As part of the solution to tackle cardiovascular disease, a shebika can generate awareness in her community about heart-health and monitor the food preparation and eating habits of people through regular door-to-door visits. Since she is a local person, she will be able to ensure that patients understand their treatment, give them reminders to take medicines and provide regular supply of drugs. A shebika can also promote physical activity and provide support for smoking cessation, as well as refer patients to hospitals when required. BRAC is now using the model in 23 districts to control the prevalence of non-communicable diseases, particularly hypertension and diabetes – the leading causes of cardiovascular disease. The organisation has trained shasthya shebikas to carry out pre-screening, referral and behaviour change activities. With the help of 446 shasthya shebikas, in a span of six months, BRAC has referred 1,239 hypertensive patients by measuring their blood pressure and 1,360 diabetic patients by measuring their blood sugar level. The government is providing treatment support to these referred patients. BRAC’s experience demonstrates that this model can be implemented on a substantial scale to have an impact in treating cardiovascular disease (Islam et al, 2011). It is evident that with training, a shebika can handle screening and treatment support; additional costs would largely be limited to diagnostics and medications. Community-based intervention creates a scope for behaviour change where environmental component plays a strong role. Through this model, a shebika offers the people of her community all the necessary tools to take control of their own lives. Maeesha Saiara Khaled is a communications officer and sub-editor at BRAC.